Muhsin Khan O you wrapped in garments (i.e. Prophet Muhammad SAW)! Pickthall O thou wrapped up in thy raiment! Muhsin Khan Stand (to pray) all night, except a little. Muhsin Khan Or a little more; and recite the Quran (aloud) in a slow, (pleasant tone and) style. Muhsin Khan Verily, We shall send down to you a weighty Word (i.e. obligations, legal laws, etc.). Pickthall For we shall charge thee with a word of weight. Muhsin Khan Verily, the rising by night (for Tahajjud prayer) is very hard and most potent and good for governing (the soul), and most suitable for (understanding) the Word (of Allah). Pickthall Lo! the vigil of the night is (a time) when impression is more keen and speech more certain. Pickthall Lo! thou hast by day a chain of business. Muhsin Khan And remember the Name of your Lord and devote yourself to Him with a complete devotion. Muhsin Khan (He Alone is) the Lord of the east and the west, La ilaha illa Huwa (none has the right to be worshipped but He). So take Him Alone as Wakil (Disposer of your affairs). Muhsin Khan And be patient (O Muhammad SAW) with what they say, and keep away from them in a good way. Pickthall And bear with patience what they utter, and part from them with a fair leave-taking. Muhsin Khan And leave Me Alone to deal with the beliers (those who deny My Verses, etc. ), and those who are in possession of good things of life. And give them respite for a little while. Pickthall Leave Me to deal with the deniers, lords of ease and comfort (in this life); and do thou respite them awhile. Muhsin Khan Verily, with Us are fetters (to bind them), and a raging Fire. Muhsin Khan And a food that chokes, and a painful torment. Muhsin Khan On the Day when the earth and the mountains will be in violent shake, and the mountains will be a heap of sand poured out and flowing down. Pickthall On the day when the earth and the hills rock, and the hills become a heap of running sand. Muhsin Khan Verily, We have sent to you (O men) a Messenger (Muhammad SAW) to be a witness over you, as We did send a Messenger [Musa (Moses)] to Fir'aun (Pharaoh). Pickthall Lo! We have sent unto you a messenger as witness against you, even as We sent unto Pharaoh a messenger. 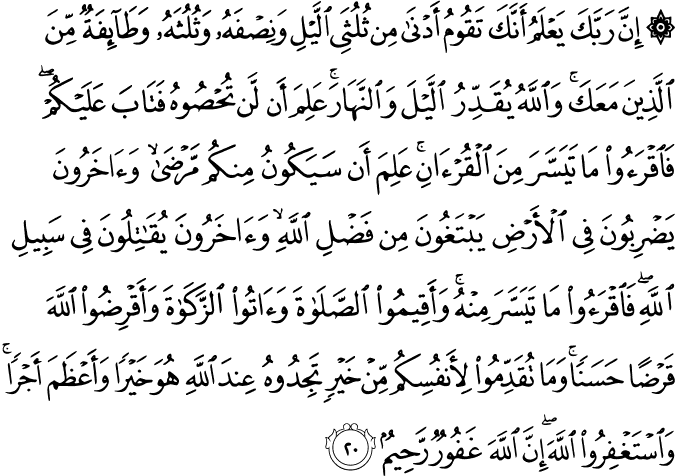 Muhsin Khan But Fir'aun (Pharaoh) disobeyed the Messenger [Musa (Moses)], so We seized him with a severe punishment. Pickthall But Pharaoh rebelled against the messenger, whereupon We seized him with no gentle grip. Muhsin Khan Then how can you avoid the punishment, if you disbelieve, on a Day that will make the children grey-headed (i.e. the Day of Resurrection)? Muhsin Khan Whereon the heaven will be cleft asunder? His Promise is certainly to be accomplished. Pickthall The very heaven being then rent asunder. His promise is to be fulfilled. Muhsin Khan Verily, this is an admonition, therefore whosoever will, let him take a Path to His Lord! Pickthall Lo! This is a Reminder. Let him who will, then, choose a way unto his Lord. Muhsin Khan Verily, your Lord knows that you do stand (to pray at night) a little less than two-thirds of the night, or half the night, or a third of the night, and so do a party of those with you, And Allah measures the night and the day. He knows that you are unable to pray the whole night, so He has turned to you (in mercy). So, recite you of the Quran as much as may be easy for you. He knows that there will be some among you sick, others travelling through the land, seeking of Allah's Bounty; yet others fighting in Allah's Cause. So recite as much of the Quran as may be easy (for you), and perform As-Salat (Iqamat-as-Salat) and give Zakat, and lend to Allah a goodly loan, and whatever good you send before you for yourselves, (i.e. Nawafil non-obligatory acts of worship: prayers, charity, fasting, Hajj and 'Umrah, etc. ), you will certainly find it with Allah, better and greater in reward. And seek Forgiveness of Allah. Verily, Allah is Oft-Forgiving, Most-Merciful. Pickthall Lo! thy Lord knoweth how thou keepest vigil sometimes nearly two-thirds of the night, or (sometimes) half or a third thereof, as do a party of those with thee. Allah measureth the night and the day. He knoweth that ye count it not, and turneth unto you in mercy. Recite, then, of the Qur'an that which is easy for you. He knoweth that there are sick folk among you, while others travel in the land in search of Allah's bounty, and others (still) are fighting for the cause of Allah. So recite of it that which is easy (for you), and establish worship and pay the poor-due, and (so) lend unto Allah a goodly loan. Whatsoever good ye send before you for your souls, ye will find it with Allah, better and greater in the recompense. And seek forgiveness of Allah. Lo! Allah is Forgiving, Merciful.